Endrik Settegast is a well-to-do fisherman on the Curonian Spit. He has an harmonious life with his wife Elske and his small daughter. But then he meets the pretty Polish woman Madlyn and a passionate love affair develops between the two of them, which threatens the marriage despite Elske's battle to keep it alive. Endrik takes notice of Elske's efforts and stays with his family. Madlyn leaves the village; but returns again later on and their affair begins anew. Endrik still loves this woman and wants her to himself. Caught in a desperate situation, he makes a fateful decision: During a boating trip to Tilsit, he will murder his wife. DVD-R IS IN GERMAN WITH OPTIONAL ENGLISH SUBTITLES. APPROX. 108 MINS. COMBINED TOTAL. WELL-WORN, VHS-LIKE QUALITY OVERALL, BUT WATCHABLE. THERE ARE SOME MINOR SOUND-TO-PICTURE SYNCHRONIZATION ISSUES, AS WELL AS A FEW SCENES (ESPECIALLY TOWARDS THE END OF THE FILM), WHERE THERE IS SOME MINOR FREEZING IN THE PICTURE, AS WELL AS SOME DROPPING OF THE PICTURE. 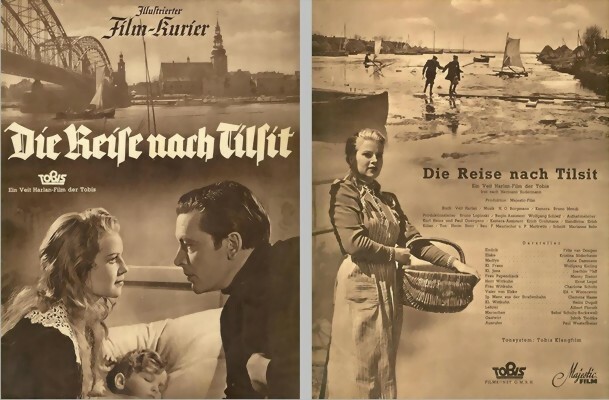 For years I have been trying to locate a print of DIE REISE NACH TILSIT to see how it compared to F. W. Murnau's 1927 silent masterpiece SUNRISE: A SONG OF TWO HUMANS. So for me this was fascinating viewing. The quality of the disc is as stated in this listing but for anyone curious to see and compare this sound version of the story that SUNRISE was based on then this is the only known source that I am aware of.